Living in Montreal, we have the privilege of shopping at a variety of different markets from all over the world, all within a 60km radius. From Lebanon to China to the Caribbean to Russia, there is a little corner for everyone, and every food. It's truly heavenly for foodies like me - having a chance to discover new foods each time I go to the grocery store. This week, I discovered Markouk (Markook) bread - an unleavened wheaty delight. (Available at Adonis for all of you Montrealers!) It's perfect for wrapping sandwiches, or eaten on it's own with nothing but honey & labneh. 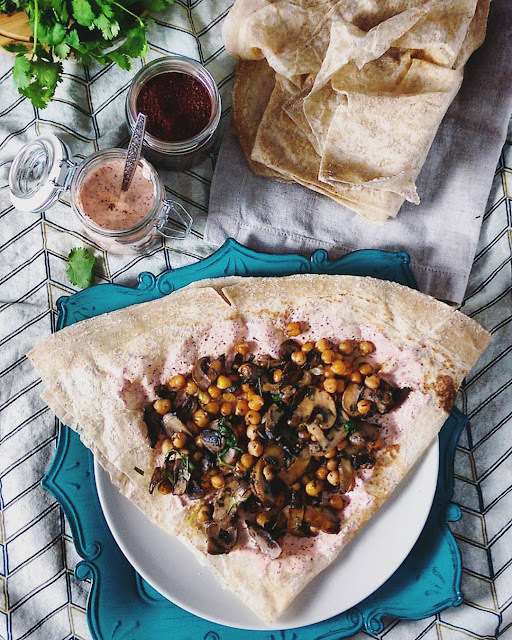 Alternatively called Shrak, this flatbread is similar to an extremely thin whole wheat pita, and popular throughout the Middle East. I rarely have labneh on hand, but I do always keep some Balkan yogurt around. Inspired by za'atar pitas (my favourite way to eat bread! ), I decided to put together a sumac-laced yogurt spread. Tossed together some mushrooms and chickpeas, and within 20 minutes, I had myself a fantastic dinner bursting with colour and flavour. Mix all ingredients together and allow to sit for at least 15 minutes. May be made in advance and stored in the fridge up to 5 days. Heat oil for one minute over medium high. Roughly chop mushrooms and toss into pan. They should sizzle when they hit it. Stir once, reduce heat to medium, and continue cooking, undisturbed for about 5 minutes. Stir occasionally, until mushrooms begin to shrink. Add chickpeas & spices. Stir. Continue cooking over medium heat until chickpeas start to have golden spots. Add arugula & cilantro and cook until wilted. Cut markouk in half. 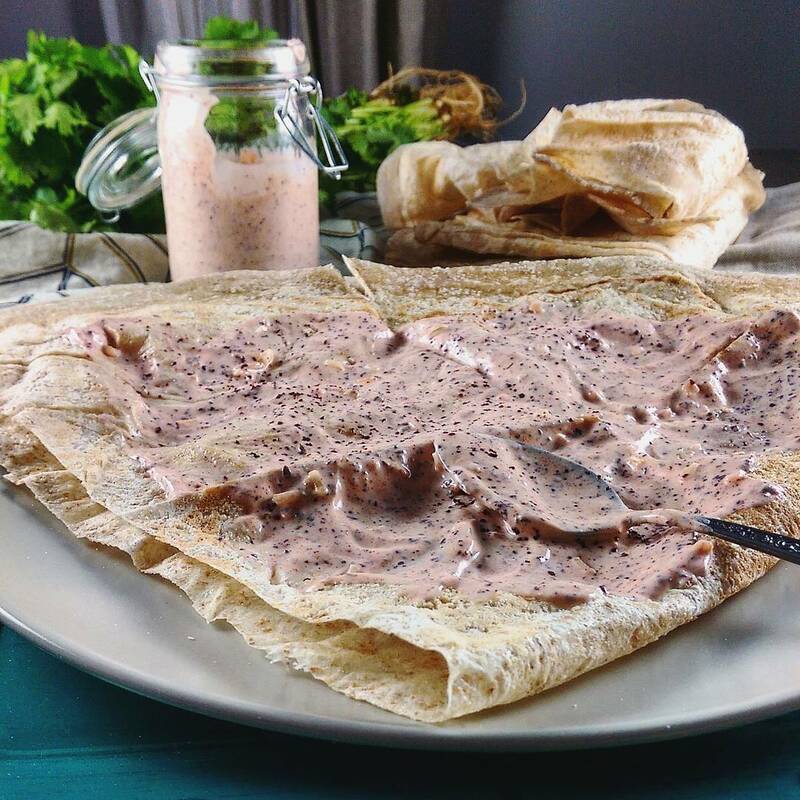 Spread each folded half of markouk (or pitas) with yogurt mixture. Top with chickpea mix & handfuls of fresh arugula.